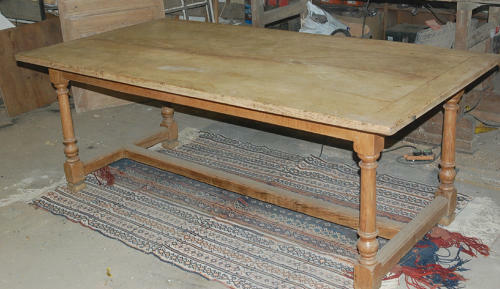 A stunning oak H-stretcher dining table that has a rustic, country look. The table comprises of a beautiful pale polished oak top that is thick and chunky, set on to darker oak carved legs. The H-stretcher style gives the table a traditional country look and has attractive turned legs. The table top has a fantastic grain giving the table great character and appeal. The table is reclaimed and has some signs of wear and some repaired damage. The top has a repaired crack to its centre. The crack is visible but the table is sturdy and gives the item character. There are some scratches, marks, knocks and stains and a slightly uneven surface. There are two dark marks on one side of the table top (please see pictures for details). The table would be perfect for a country kitchen or rustic interior. The oak is of a great quality and is very solid, making it far superior to veneered table. A lovely item with great style and character. We can organise delivery nationwide so please email with your postcode for a quote.